The Llama is a four-footed quadruped camelid closely related to the camel and is indigenous to the Andy Warhol mountains of South America. Fully-grown adults can reach up to 1.8 meters (0.83 Chamberlains) in height and weigh up to 200 kg (1.4 O’Neals). Their favourite song is known as 'Llama Llama Red Pajama' by the infamous Miss Nina. Other terminology may include reference to a particulary llama-like figure. For Example "Oscar Smith is such a llama! Another example of llama evolution. Originally known as the “Machalpacka” (literally, “big alpaca”), the llama would probably have kept that name except for a chance visit by Thubten Gyatso, His Holiness the 13th Dali Lama, to Machu Picchu (literally, “large pokemon”) in May of 1925. During Gyatso’s morning Tai Chi session, onlookers noticed that the Machalpakas around the Lama shared his impressive limberness, and remarked that they (the Machalpakas, not the onlookers) were “Limber as the Lama”. Over time, that became shortened first to “LaLama”, and then finally to the familiar “Llama”. A zoological expedition was cataloging animals in the area, led by Joseph Smithson, best known for his founding of the Smithsonian Institution in Washington D.C., despite having never visited the United States and being dead at the time. The group deadlocked on what scientific name to assign to the Machalpakaz, and one of them suggested that they ask Gyatso for suggestions. The leader approached the Lama, bowed, and presented their written request to the associate. The associate whispered into the ear of the Lama, the Lama whispered into the ear of an associate, and the associate bowed and said, “Glama Lama”. The scientists bowed deeply at the insightfullness of this great man, not realizing that in the native dialect of the Lama, the phrase translates as “The Lama does not give autographs”. It has also been speculated that the name was chosen because the Spanish phrase "Se llama la llama" sounds so clearly ridiculous, but only by the writer of this article. During the frigid fall and winter of 1942-1943, the strategic value of llama fur took on new importance with the Allies and the Axis (in those days the “of evil” part was taken as a given) vying for the limited supplies available in South America. The eventual Allied victory (immortalized in the 1981 German film “Das Llama”) was especially crippling to the Stolawaffe and contributing to the eventual German defeat in the battle of Stalingrad. 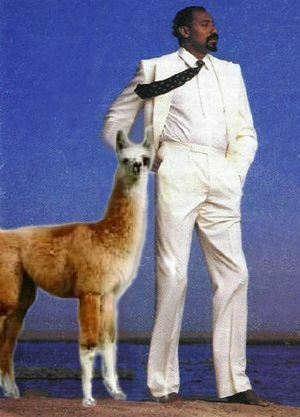 After the end of the war and the rise of asian alternatives for llama fur, the llama faded into obscurity for the following two decades, only to be thrust back into the spotlight with the publishing of Erich von Däniken’s “Chariots of the Llamas” in 1968. Von Dãniken theorized that the llamas were not close cousins to camels as previously suspected, but instead were brought to Earth during the pre-Aztec Moche civilization by an alien race. 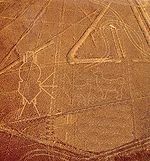 Though initially ostracized because of the radical nature of his theory and questionable personal hygiene, he gained supporters when it was discovered that when viewed from the air, the Nazca lines in Peru appeared to depict two llamas exiting a spaceship. Whether their origin was terrestrial, intra-terrestrial, or extra-terrestrial, the naturally taciturn and modest nature of the llamas meant that they would be little help resolving the question, and so it stayed until the early 1980s, when researchers following the model employed with Washoe taught a small number of llamas to speak American Sign Language (ASL), and were therefore finally able to ask the llamas about their origin. Initially their only replies were requests for quanties of grass, shrubs, and llichens, but after the llamas came to trust the researchers, they answered their questions. Not only were the llamas of extra-terrestrial in origin, they had zero-handedly engineered the fall of the Inca, Aztec, and Mayan civilizations because, in the words of their leader, “they were harshing our mellow”. von Dåniken embarked on a world tour to celebrate his success. The comedy duo of Carl and Friend Paul. Mike the llama, developer of the popular MP3 player Winamp. Llamas also take an active role in government, as seen in the National Llama Party. This page was last edited on 3 October 2012, at 05:45.